Get started now to contact professional outfitters who have openings for the animal you wish to hunt, within your budget. The outfitters that best match your hunt criteria will contact you via email or phone. 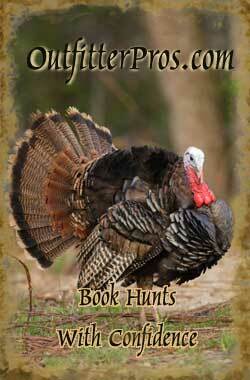 Each hunter that that completes a Find A Hunt form qualifies for prizes in our Giveaway Contest. Grand Prize: TC Bone Collector Triumph .50 Cal Muzzle Loader. Quarterly: Your choice of over 100 hunting products worth $75-$100. Monthly: Bass Pro Shop gift cards. Intermedia Outdoors, the country's largest hunting/outdoor magazine company, recognized OutfitterPros.com as a trusted resource in their July/August 2010 family of Game & Fish Magazines in an article entitled "Avoid Outfitter Regrets". Click HERE to read that article. One simple form matches your hunt criteria with pre-screened professional outfitters. No more scouring the internet and burning the phone lines trying to identify reputable outfitters that offer the exact hunt you're looking for, in your price range, and with openings for the time frame you want to hunt. After you complete the Find A Hunt form, we'll provide you a link to our Twitter page where we share Hunting Deals and Specials for Deer, Elk, Moose, Bear and more - early bird specials, cancellation hunts, DIY hunts, group specials, etc. Each outfitter must pass our exclusive 5 Point Outfitter Rating System in order to have their hunts listed in our database. Does it cost anything to use the site? No, the site is free for serious sportsmen to match up with reputable guides and outfitters. What happens when I decide to book with an outfitter? 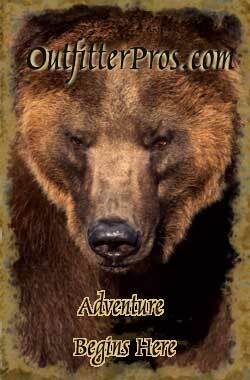 You will contract directly with the outfitter for the trip you decide upon. Most will require a deposit (50% is typical) to hold your spot. Be sure to inquire about the outfitter's deposit refund policy - that information should be in the hunting or fishing trip contract and/or on the outfitter's website. I want to hunt a particular sub-species, but don't see them in the menu. How do I provide this data to the outfitters? Use the Comment box on Step 2 of the Find A Hunt form to specify a particular sub-species (examples: Turkey - Eastern, Rio, Merriam, Osceola; Moose - Alaska-Yukon, Shiras, Canadian). You are encouraged to enter everything of importance to you relative to your hunt request in the Comment box. Are you reputable, licensed, insured, with recent hunter references? See our Outfitter's Guide to learn how our site can put you in contact with pre-qualified hunters. 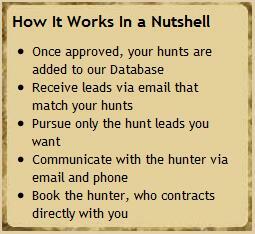 Our business model is the first of it's kind in the hunting industry. We chose this model because IT WORKS, and it's cost-effective to outfitters. Our business model is similar to ServiceMagic.com, an internet company that boasts a client base of over 50,000 home contractors. ServiceMagic provides it's member contractors over 300,000 leads a month from homeowners needing electrical repairs, plumbing repairs, new roofs, window replacements, etc. We've gone one step forward compared to ServiceMagic, which charges for each and every lead. We provide unlimited leads for a low monthly fee. See our Outfitter's Guide to learn more. After you complete your Hunt Form, visit our friends over at "Deep South Outdoors".